Info: The Aldebaran, as already mentioned, about 65 light years from Earth, is regarded as origin of those who have made the earth, the origin of cultivated. Some of the Aldebaran ancestors are called gods. In a certain way, they are there for people today as well, but also their blood flows in our veins and makes us equally demigods. Aldebaran, the term is derived from an Arabic name and means "Subsequent". Aldebaran is located in the constellation Taurus and is also referred to as the heart of the bull "Cor Tauri". By the very Aldebaran to the vibrations and the channeling messages the media have taken before the Vril cult was rekindled, and continues today. Although the Aldebaran is about 65 light years from earth, it is for the Haunebutechnik only a short hop. The Haunebu fleet "project Nordmark" thus constitutes the shock troops for home star. In addition to the Aldebaran mission is erreichtet a base on the moon, directly in the remnants of past projects which for many years were no longer possible. Of the Mars bases facilities are built for further expansion in space which will also form the backbone of Haunebuflotte. Haunebu ahead! 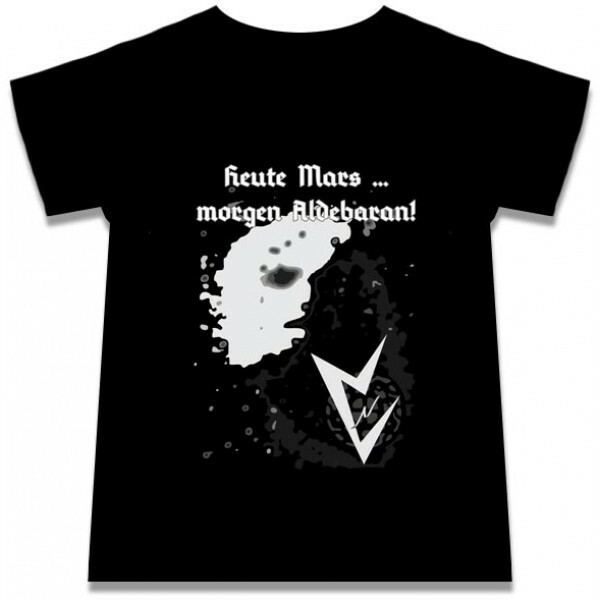 Customer evaluation for "Heute Mars ... morgen Aldebaran! - Shirt (Lim100)"